During the summer months in New York City, you often hear people talking about plans to escape the city’s heat with trips to the beach or mountains. 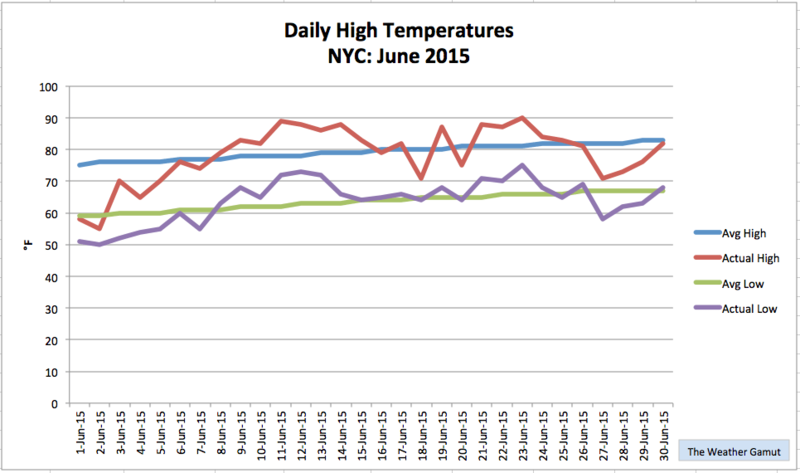 This is because NYC, like most large cities, is an urban heat island. With miles of paved surfaces that absorb heat, it is generally warmer than surrounding rural areas. 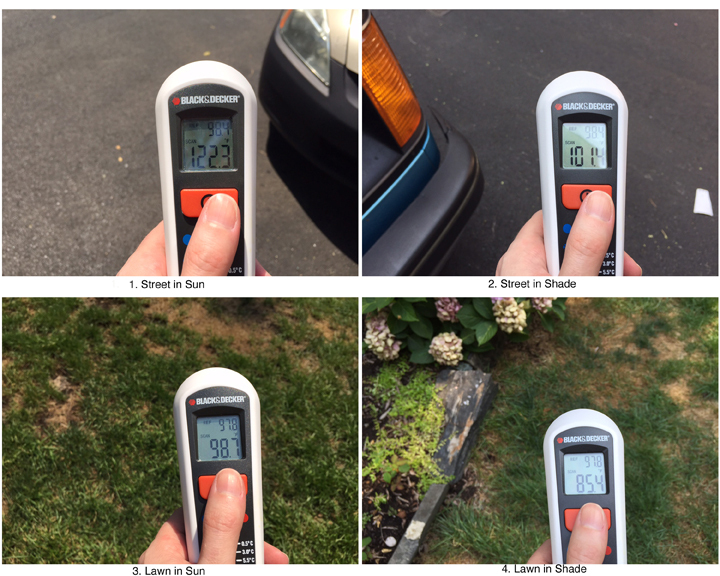 Within city limits, the temperature difference between an asphalt covered street and a nearby park lawn can demonstrate this phenomenon on a smaller scale. Below are some photos of measurements we made around midtown Manhattan at 2:30 PM this afternoon when the air temperature was 95°F. On the street, the temperature was 122°F in the sun and 101°F in the shade. On the park lawn, only a few feet away, the temperature in the sun was 99°F and a relatively cool 85°F in the shade. Hands down, the best place to beat the heat – even in the city – is on a grassy surface in the shade. Stay cool! Comparing temperatures of surfaces in the sun and the shade around midtown Manhattan on July 29th when the air temperature was 95°F . Credit: The Weather Gamut. Summer is wildfire season in the American West, and it is off to a raging start. So far this year, according to the National Interagency Fire Center, wildfires have burned 5.5 million acres across the US. That is an area roughly the size of the state of New Jersey. It is also the second highest total (as of this date) in the last 25 years. As of Monday, 22 large wildfires – defined as greater than 100 acres – are burning in 5 states. In California’s Napa Valley region, the Wragg Fire has scorched 7,000 acres and forced many residents to evacuate. In Montana, a massive blaze has burned approximately 5 square miles of Glacier National Park since it began last week. The majority of the acres burned, however, have been in Alaska. They have seen nearly 4.7 million acres charred, which is about 85% of the national total to date. High temperatures and prolonged drought in the West have turned forests and brush areas into tinderboxes that are susceptible to any type of spark. While summer is usually hot and dry in California, the state is enduring its fourth year of drought. Alaska has also been unusually warm and dry. In fact, according to NOAA, they are in the middle of their second warmest year on record, year to date. These warm temperatures helped produce a dearth of winter snowfall, which has lead to drier than normal conditions across a large area of the state. 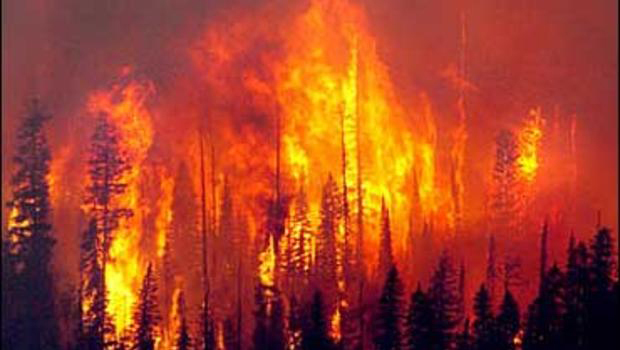 Overall, wildfires in the US seem to be getting worse. In Alaska, 3 of the worst wildfires have occurred in the last 12 years. In California, 12 of their 20 largest fires have taken place since 2000. In both states, wildfire records date back to the 1930s. Nationally, summer 2015 is on track to be one of the worst wildfires seasons on record. This summer has been marked by heavy rain and even flooding in many parts of the United States. 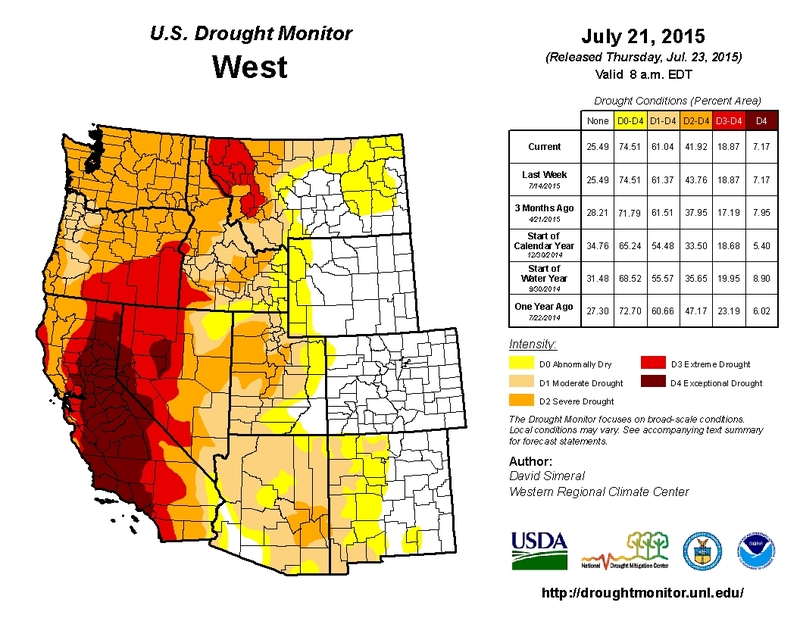 Drought, however, continues to plague large sections of the country. According to the latest report from the U.S. Drought Monitor, 36% of the nation is in some form of drought. While this number represents improvement for some areas, such as Texas and the southern plains, the western states remain very dry. Conditions of moderate drought or worse cover 61% of that region. In California, despite some unseasonably heavy rain recently, the long-term drought – now in its fourth year – continues. 97% of the state is experiencing conditions of moderate drought or worse and 46% is in extreme drought, the worst possible category. 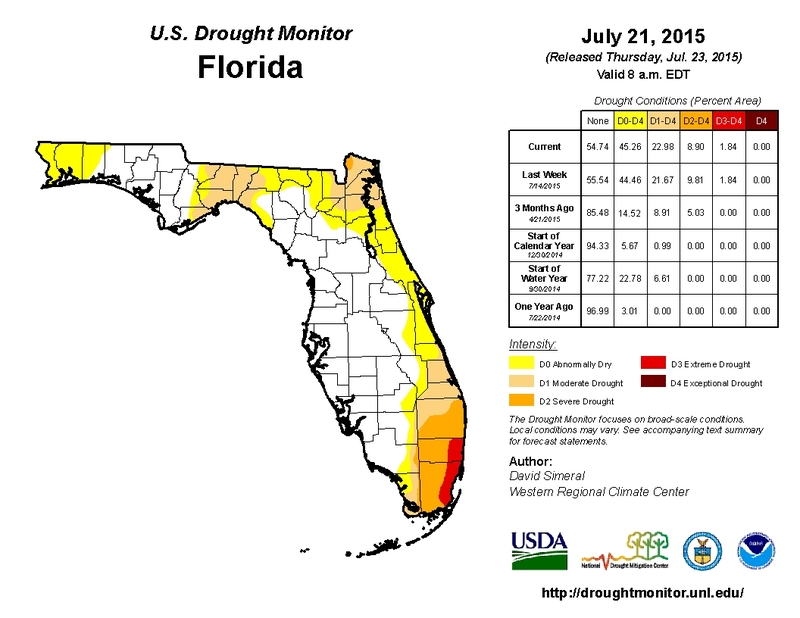 On the other side of the country, drought is also impacting parts of Florida. This is fairly unusual as summer is considered the rainy season there. Currently, 45% of the Sunshine state – mostly along the east coast – is experiencing some form of drought. That is up from 15% from just three months ago. Portions of the highly populated areas of Broward and Miami-Dade Counties, on the southeastern tip of the peninsula, are dealing with extreme drought. Our global temperature continued its upward trend last month with June 2015 marking the warmest June ever recorded for the entire planet. According to a report by NOAA’s National Centers for Environmental Information, Earth’s combined average temperature for the month – over both land and sea surfaces – was 61.48°F, which is 1.58°F above the 20th century average. It surpassed the previous record set last year by 0.22°F and marked the fourth highest monthly departure from average for any month on record. 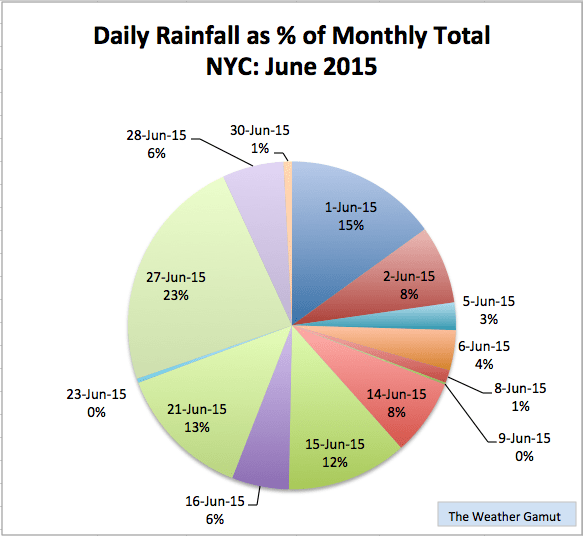 June was also the third month this year to break its monthly temperature record, joining March and May. The other months of 2015 each posted readings that ranked in their top five warmest. For the oceans, the globally averaged sea surface temperature for the month was 1.33°F above the 20th century average of 61.5°F. That is the warmest reading on record for any June, eclipsing the previous record set just last year. It also tied with September 2014 as the highest monthly departure from average for any month. While moderate El Niño conditions – a natural climate pattern that boosts oceanic and atmospheric temperatures – played a role in June’s record heat, it does not tell the whole story. The long-term trend of human-caused climate change was also a key factor. NOAA reports that fourteen of the fifteen warmest years on record have occurred since 2000 and they were not all El Niño years. Year to date, the first six months of 2015 were the warmest of any year on record. Global temperature records date back to 1880. Today, I will be giving a presentation on the “Art and Science of Climate Change” for a Human Impacts Institute event at the Prospect Park Zoo in Brooklyn, NY. My talk will cover both the basic science of climate change and explore how artists from around the globe have been responding to its various impacts and possible solutions. More speaking events coming this autumn! Earth’s climate is a complex system with many interacting parts, including the atmosphere, oceans, land surfaces, ice, and the sun. To better understand how it works and to make projections for its future behavior, scientists use computer-based simulations known as climate models. These models, according to the World Meteorological Organization (WMO), incorporate the physics and chemistry of the climate system’s various components. Using mathematical representations, they aim to answer questions such as when the next El Niño or La Niña event might develop and how the climate will respond to increasing amounts of greenhouse gas concentrations. Developed from weather forecasting models, climate models look further out in time and involve an extremely large number of calculations. To run, they require very powerful computers. In fact, the WMO says it can take several months to complete a 50-year projection. Dividing the planet into a three-dimensional grid, a climate model simulates the movement of air, water, and heat energy within each of its grid cells and evaluates interactions between them. All of these processes are based on the laws of physics. When all the processes from all the grids are linked together over time and space, the model simulates Earth’s climate. As with weather, there are a number of different climate models in use around the globe. Some, according to the IPCC, perform better than others for particular aspects of the climate system. The variations in predictions that they produce are generally the result of differences in initial conditions, different parameters for interactions between parts of the system, and different estimates of future greenhouse gas emissions. That said, all the climate models included in the IPCC report agree that Earth’s average temperature is rising and expect it to continue to rise in the future. To see if a climate model will perform well, it is tested against the past. This is a process called Hindcasting. If a model accurately predicts climate trends that have already taken place, it is expected to predict what might happen in the future with a reasonable amount of certainty. Models can also be refined as new sources of data become available. Below is a short video by The National Academy of Sciences on the basics of climate modeling. Credit: NAS and YouTube. The Earth will reach its Aphelion today at 19:41 UTC, which is 3:41 PM Eastern Daylight Time. This is the point in the planet’s orbit where it is farthest from the Sun.